modern-day Kortenhagen provided by John Schomaker. Kortenhagen, the Pagels' first home, was a small village in Kreis Greifenhagen in Pommern. It was located in the region of Pommern that was given to Poland as part of the Yalta Agreement in 1945 and its German residents were driven from the area. 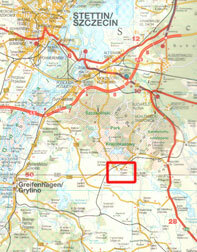 Recent correspondence confirms that members of the Dickow family were still living in Kortenhagen until 1945 when they were forced into East Germany by the Russian military. They were not allowed to return home when the war ended. 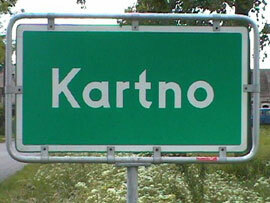 Today the village is known as Kartno. It is located west of the Oder River, about ten miles east of Gryfino (formerly Greifenhagen) and south of the city of Szczecin (Stettin). When the Pagels lived in the village of Kortenhagen, most people lived in very small cottages or in a barn if they were farm workers. They practiced the Lutheran faith. "Pagel" is the Slavic form of "Paul" and the first people in this region were indeed Slavic. Kortenhagen was nestled amongst rolling hills covered by woods and farmland. The people who emigrated from there were usually those who did not own their homes or farmland. Businessmen in Berlin and Hamburg organized travel to America. 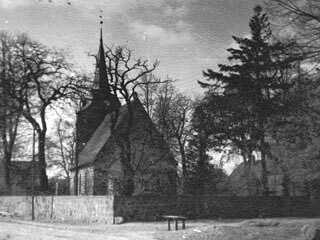 Before World War II Kortenhagen had eighty houses and 385 inhabitants, although residents had begun to leave the area. Many farmers were bankrupt and left to find work in the cities of Berlin and Stettin. Much of Kortenhagen was destroyed during World War II. As the Russian front approached in early March 1945, the villagers moved west, deeper into Germany. Church and civil records that would help us learn more about our Pagel ancestors were either destroyed during the war or taken to Russia along with anything of value. After the war when the area was given to Poland and the former German residents were banished, they were replaced by people from Eastern Poland, the area that is now Biello Russia and Ukrainia. Until 1990 most of the buildings were owned by the Polish government. 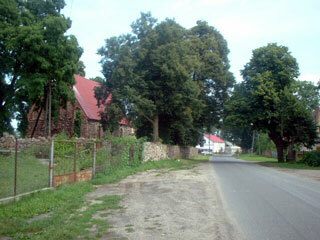 The current Polish inhabitants are small farmers with little income, so there is no money to rebuild or repair the village which is now known by the Polish name, Kartno. Sabine Jonsdotter lives in Hamburg. Her grandmother grew up in Kortenhagen before World War II. Sabine sent two photos that offer glimpses of the village during that time period. We believe this is the same church pictured above, but from the other side. Notice that it had a steeple that is no longer standing. See more recent photos that show evidence of damage to the building and seem to reinforce the idea that the old photo is of the same church. 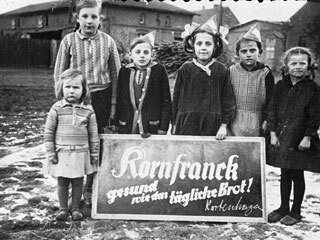 This photo was taken in Kortenhagen in February 1932. On the right is Sabine's grandmother, Dorothea Duwe, standing next to her sister, Friedchen. Sabine would love to know the identities of the other children.